Nobody alive today can deny that Electric Skateboards have conquered the world. It’s not hyperbole in the least to say that, like Segways and Hoverboards, Electric Skateboards are one of the biggest tech trends happening in the world right now. One of the main problems is that there are a lot of manufacturers and companies producing these fine products. Sometimes it’s hard to choose which one to purchase – much like walking into a grocery store without a list; often, too many choices end up freezing us in our tracks and our mind comes to a standstill. Today, we’re going to be looking at the best electric skateboards to help you make decision because there are just too many high-quality, premium electric skateboards out there. First, though, let’s take a more investigative look into the world of these popular e-devices, and what you should be on the lookout for when you’re browsing for one. Now that you know what to look for in your Electric Skateboard, let’s take a look at electric skateboard that are responsible for providing us as much fun as possible. The Dual+ is considerably more expensive than Dual. However, once we dig deeper into the differences, we see the major reasons the price is so different. The Dual reaches a top speed maximum of 20mph, and the Dual+ reaches up to 22mph. While the Dual can climb only 20% grade hills, its older brother Dual+ can climb a staggering 25% grade hills. Where these two devices are similar is in its maximum range – which is approximately 7 miles total. The single-motor LiftBoard can take you to a maximum speed of 16mph. You can also travel up to 16 miles on a single battery charge, and climb hills with a 15-degree incline. Now, when it comes to the Dual LiftBoard, you get exactly that: dual motors for a total 1800W of staggering raw power. This makes it easier for you to accelerate quicker, and lets you conquer rougher hills and higher terrain. However, maximum speed is only slightly increased; at 18.6mph top speed, you certainly go faster – though not by much. The total distance you can travel is also 16 miles. Know, though, that you can expect to “climb” hills that are 25-degrees. The Dual has a 3-month warranty. Both skateboards come with a wireless remote you can hold while you ride, controlling your speed and other features. Thanks to its shocking 3000W dual-motors, the HaloBoard electric skateboard can take you up to a mind-blowing 22mph (which is phenomenally fast for these things). On a single battery charge, expect to travel a total of 12 miles. Instead of building their board with wood, HaloBoard decided to do things differently, and constructed their skateboard with 100% Japanese T700 carbon fiber. Compared to other materials, carbon fiber has a superb weight-to-strength ratio that is hard to match or beat. Not to mention the fact that it can withstand insanely brutal heat temperatures with little-to-no damage, and is ten times stronger than steel (while being five times lighter) and eight times stronger than aluminum. The trucks themselves are also made of aluminum, with a 9.25” width, making for more ergonomic turns while riding; this makes it easier to reach those top speeds faster. However, it’s worth knowing that this puppy takes ~3 hours to charge, which is quite a hefty length of time. Personally, this trade off is worth it considering the value you get. The HaloBoard is one of the best electric skateboards in the market and comes with a 6-month warranty. Yuneec claims their E-GO electric longboard is “the lightest electric skateboard” currently on the market. What makes this claim even more staggering is how much the E-GO carries – up to 220lbs. with no problem, while weighing only ~22lbs. The Lithium-ion battery is partly to thank for this lightweight board carrying such a tremendous weight without sacrificing powerful performance. You can expect to travel as far as 13 miles on one battery charge. People have claimed that the max speed is 12.5mph on flat, leveled surfaces (such as paved roads and streets). As you’d reasonably guess, the E-GO2 has much better reviews but is considerably pricier than its predecessor. Acton has been a dominating force in the E-Skateboard industry. On the lower end (i.e affordable) of the spectrum we have the Blink Lite – which is exactly what it is: Lite. The Blink Lite travel 5 miles maximum before requiring battery recharge. However, it does have 3 ride modes which makes every ride a unique experience. The S can travel up to 7 miles maximum before needing a recharge. The Acton Blink S is perfect for leisure rides, as its’ speed tops out around 15mph. If this is too fast for you – the S also has regenerative braking. The Acton Blink S2 commands serious respect with its powerful dual hub motors. These motors can take you as far as 14 miles (which is far, when you think about it) and moves you as fast as 18mph. The Blink QU4TRO is by far Acton’s most breathtaking electric skateboard. Not only can it take you for a total distance of 22 miles, it also roars up to a whopping 23mph. Acton accomplished this amazing feat by installing four hub motors in the QU4TRO. On their website they claim that the board is “built like a sports car,” and it’s easy to see why. Maxfind’s dual-motor E-Skateboard comes in two versions: A and B. The difference between these two versions is that B has carrying handles actually built in to the board, whereas the A does not. While this makes the B version easier to carry around, the board itself is actually wider than the A version. Other than that, however, the specs are similar. Maxfind’s dual motor deck is made of an 8-ply material (totalling 37.99”), and feels tremendously stable. This is particularly helpful to know, as it carries a maximum 220lbs. without any problem. Personally, what makes this admittedly-huge board a stand-out amongst other boards listed here is Maxfind’s charging time. When the battery is depleted and it’s time to recharge the board, it will be almost 90% charged in nearly half an hour. On the slower-end of the speed scale (12mph), this board wasn’t designed for speed freaks or racers; this board was people who are looking for a pleasurable ride at their own convenience. As the tires are designed for all terrain, you can ride in… well… all terrain. The M3 can carry people up to 220 lbs. and has 81.4Wh / 162.8Wh battery capacity. Like most boards, it’s also Bluetooth compatible and controlled entirely by remote (which is included in the shipping package). This is one of the few electric Skateboards I’ve seen made out of 4 layers of fiberglass and 4 layers of bamboo. It is also water/dust-proof and the wheels absorb shocks phenomenally well. Depending on conditions such as your weight, the surface you’re riding and how tall you are (all playing into wind-resistance)… you can expect to ride up to a fun 22mph. When Atom designed their B.36 electric longboard skateboard, they made a monster. This board has the smooth, agile feeling of a classical Longboard – with the powerful driving force of an electric motor, giving you a bit more “oomph” when you’re riding. This is thanks to dual 1800W brushless motors (3600W total), a 211WH lithium-ion battery pack (made by Samsung) and all at only 17 pounds, Atom wasn’t playing around when they designed this beast. You can expect to travel a total of 12.5 miles. The GT Powerboard by E-Glide comes in two colours: black anodized and aluminum. Thanks to these state-of-the-art electronics, you can blast from 0-23mph in less than five seconds. It has a transverse flux motor, meaning you have a lot of torque power to conquer any steep hill or incline. Thanks to its brushless hub motor, you can travel as fast as 15mph and travel as far as 7 miles. Which are incredible feats for such a “small” e-vehicle. The fact that it’s so compact and lightweight means it only takes 20-freaking-minutes for the Ultracharger to fully recharge. Plus, it’s completely suitable for off-road terrain. Mega cool. The Swagtron Voyager can carry up to 330lbs. – this electric skateboard supports the most weight I’ve seen in a long time. This is thanks in part to the eight layers of Canadian Maplewood and two layers of bamboo. Not to mention that at 42”, it’s much longer than 3 ft., giving you an ultimately-smooth ride up to 15mph with dual 350W motors. Compared to the Voyager, you could think of the Swagboard as a little brother/sister. As this board was primarily designed by Swagtron for kids, the drastic price difference is due to the Swagboard’s ability to go no faster than 11mph, which is still a relatively-fast speed that doesn’t compromise safety. 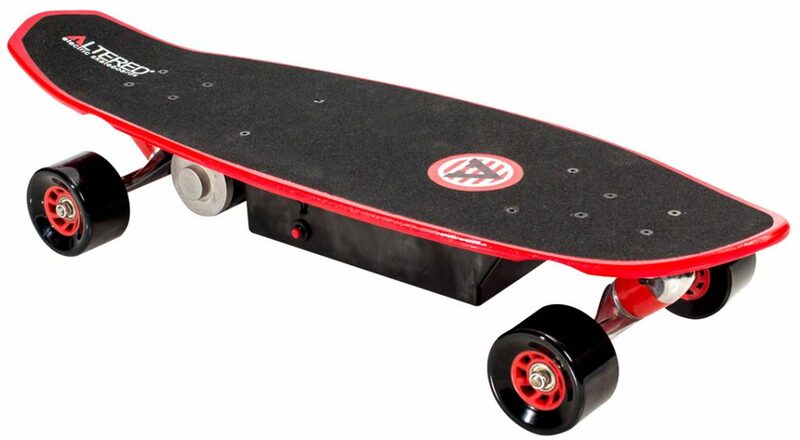 However, you can travel up to 10 miles (which is tremendous feet for an E-skateboard at this price). The deck is constructed from 7-ply Maplewood (carrying up to 187 lbs. ), hence its lower price. This is a board suited for lightweight/shorter-than-average people who enjoy going fast and feeling agile while riding. This board’s lightweight makes it easier to turn on sharp corners and tricking. What’s most remarkable about this board is the fact it’s UL2272-certified. This certificate means it has passed hundreds of industry-standard safety and electrical tests; these are the same premium-standard tests commercial used to test Hoverboards. These tests were created to make all electronic transport vehicles safer to ride as a result of many battery-related fires that caused hundreds of injuries early 2015. When you take the Tomahawk out for a ride, expect to blaze through the wind at 20mph for a total distance of 20 miles – depending on your riding mode. When it comes to electronics, almost every manufacturer uses Lithium-ion batteries to power their products. Genesis’ products are no different, showing that they’re adamant about providing you top-level safety and board performance. The Altered Fantom Skateboard is one of the few electric skateboards exclusively designed for kids. This board is fundamentally designed to be easier for children to ride than regular skateboards. All they have to do to gently and gradually accelerate (or go forwards) is “squeeze” the trigger-style grip with their feet; their feet, by the way, will stay firmly planted to the specially-designed deck. The braking system is a patented system that ensures optimal safety for your children. Altered Fantom claims this electronic skateboard is “a revolutionary board in the industry.” Let’s take a look at why they say this: they say this because they put patented torsion trucks (which allow for more precise and tighter, easier turns) on the deck, which gets rid of “wheel-bite” (that annoying sound you hear when trucks/wheels suddenly turn and ‘catch’ the rider, potentially throwing him/her off). This device reaches a safe top speed of 10mph and can be ridden for 40 consecutive minutes on one battery charge. This board is a great bargain for kids to ride. The deck is crafted from a 7-ply “rock hard” maple deck that can withstand all the brutal abuse it’s bound to be in. 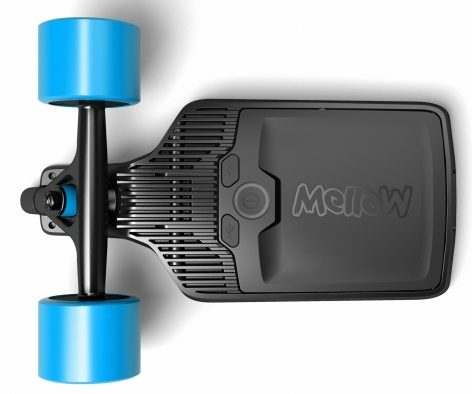 The Mellow Drive is an electric truck that attaches to any skateboard like any regular truck. It has dual in-wheel motors, is water/dustproof (with an IP56 rating), comes with a two-year warning, and has a 9 mile max. distance. Expect speeds up to 25mph. Koowheel’s D3M Longboard E-Skateboard has dual brushless hub-motors. However, what separates the D3M from the competition (for me) is the fact that the board is UL2272 and ASTM-certified. What this means is that this Electric Skateboard has passed hundreds of industry-standard safety and electrical tests; often the same tests given to the ever-popular Hoverboards. Whether all Electric Skateboards have this UL2272 certificate or not is unclear, but I admire the fact that Koowheel unabashedly states this on their website; doing this makes me feel safer about buying (and riding) the D3M. That’s not all: It’s normal speed is 18mph, and its top speed is 27mph. Clearly, this remote-controlled skateboard is fast. Not to mention that its Smart chip is designed to prevent accidental acceleration and unintended braking. You can expect to travel a total distance of 27 miles. As you can see, buying an Electric Skateboard requires as much foresight (if not more so) required when purchasing most high-end products. I hope you’ve found some insight and managed to make an easier decision. I simply cannot overstate the sheer freedom and fun that these boards provide – the experience of riding these electric babies down a steep hill, at the literal push of a button cannot be adequately explained. However, as previously mentioned it must be said that electric skateboards can travel faster than you anticipated – whether you’re an experienced skater or not. It all depends on your real-life reaction times to certain situations, and it must be stated that proper care, respect, and responsibility be withheld at all times while you’re riding. Just as skateboards are not a mere toy, the same is with these electric brethren. Don’t let that deter you, though. Electric skateboards were designed to be fun, and should be ridden with this in mind. The world is quite literally your oyster, and we should all do everything we can to “seize the day” in these increasingly-turbulent times. In case all the jargon and terms used in this article have confused you, don’t worry: next we’re going to walk through a glossary of e-skateboard terms so you understand precisely what all this “tech speak” means.